Need to be treated like wooden window frames, you need to treat them on a regular basis to prevent the wood from drying out and splitting. Never use water to clean them. 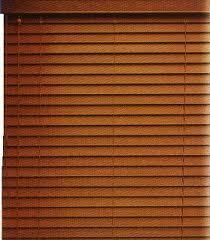 Wooden Blinds come in a variety of finishes, and grades. From light oak to dark mahogany and even Bamboo, the wood finish is almost limitless. You can also get laminate finished pressed board, which again comes in a variety of finishes and colours. They are rather heavy so if possible keep them small. Divide window into two small blinds rather than one large. Laminates are heavier than Base wood, so keep to the smaller sizes. The wood will dry out in the sun, so look after them well, and have then cleaned and treated on a regular basis.